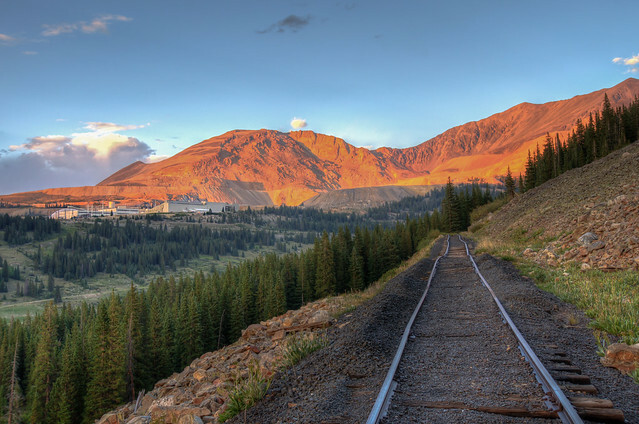 Abandoned railroad tracks from days gone by are overshadowed by new activity on the mountain. Straddling the Continental Divide at 11,360′ Freemont Pass, the Climax, CO mine comes to life for the third time in a hundred years. A large outcropping of grey mineral material was first discovered in 1879 by Charles Senter. He placed mining claims in the area, and maintained those during the 16 years it took to identify the mineral as molybdenite. The mine fully ramped up the first time in 1916, when molybdenum was used as a steel alloy and demand was high due to material needs created by World War I. The mine closed down after the war when the demand dried up, before opening again in 1924 and enjoying a continuous run into the 1980s. With a 20 year supply of ore already identified, it looks like another Leadville boom may be underway. I use the term ‘photo shoot’ pretty loosely here. I am working hard at improving my photography skills, and like to compile a blog post whenever I shoot a bunch of photos of a particular subject, work with a new technique, or try to deal with challenging conditions. I’ll typically include a little self-critique on the photos to help me spot errors and things that I could do better the next time. I am also using these posts to document memorable experiences, interesting places or events, and life in general. Hopefully I will be able to look back on the pictures in a few years and notice some good progress in my abilities. I set off after work on Friday for a little photo-adventure. 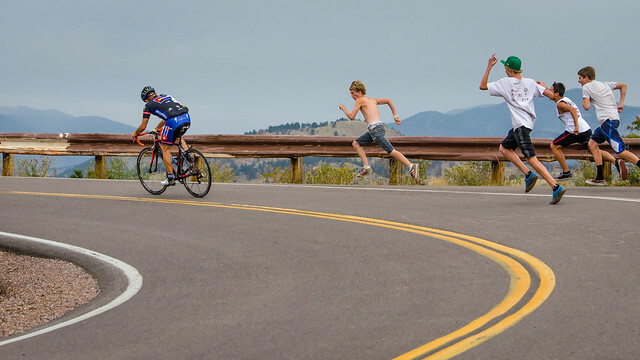 My good friend was racing his bike in a time trial up Lookout mountain, and I wanted to get some pics of the action. In much the same way a golfer goes to the driving range to practice, I look at stuff like this as an opportunity to work on my photography skills and hopefully improve on them a bit. I learn a ton each time I do it – it’s amazing how tough it can be sometimes to get the exposure and focus just right, let alone come up with a good composition. 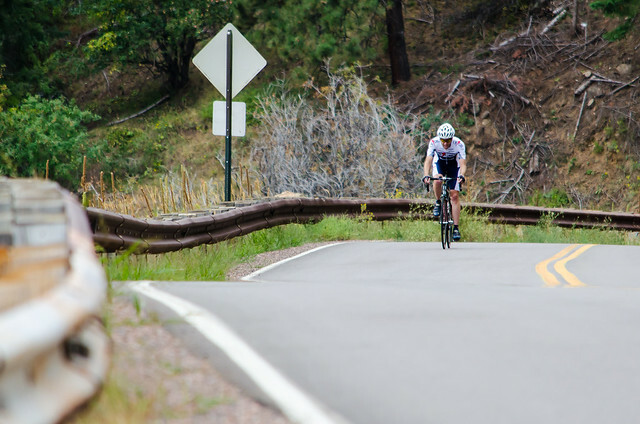 The great thing about the event being a time trial format, is that I would have plenty of chances to practice as the riders were starting at 30 second intervals. Much better than a big pack flying by in the blink of an eye. I have climbed this mountain many times in the past, so I knew it well. It was still hard to come up with a good spot to shoot from. I looked for an area where I could see the riders coming from a distance so I could have some advance warning. 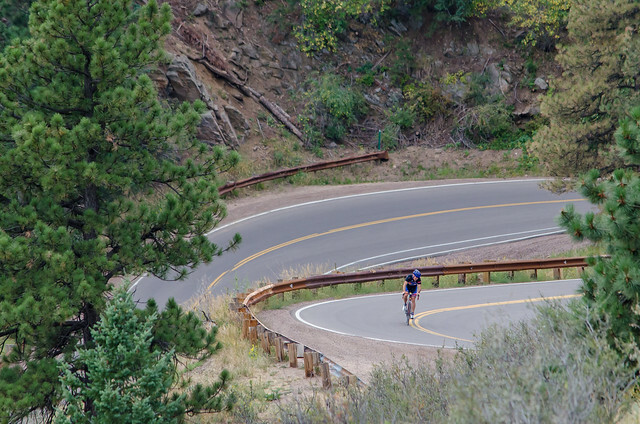 I also wanted to be able to shoot after they had ridden by, so I positioned myself a little bit below a switchback – that way I could still get some side shots as the riders went around the corner. I set up next to a group of high school kids that had come out to watch. They kept me pretty entertained! 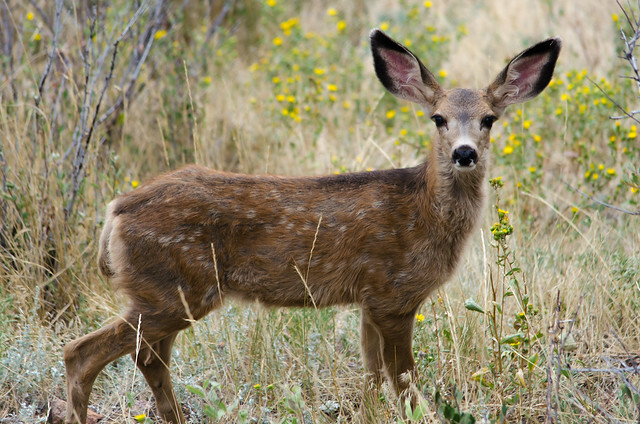 A doe and two fawns walked by on the slope below, and I caught this one just right. Now it was time to set up for some shots of the racers. The evening was very overcast, but the light ended up being ok. I really like the composition of this one, but probably should have let the rider get a bit closer. 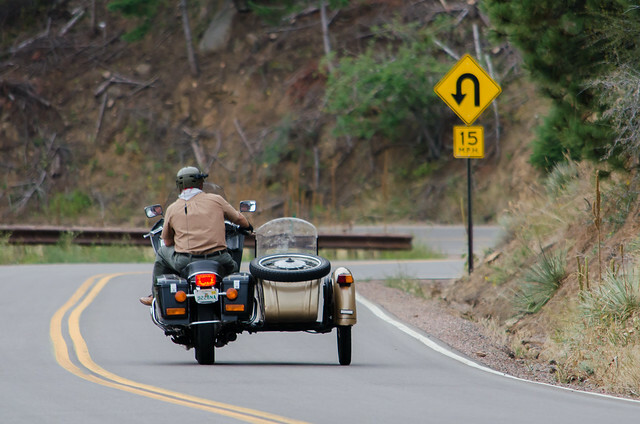 Couldn’t resist this shot of a vintage motocycle with sidecar after it passed. More clowning around. Those kids made me feel really old and young again all at the same time. 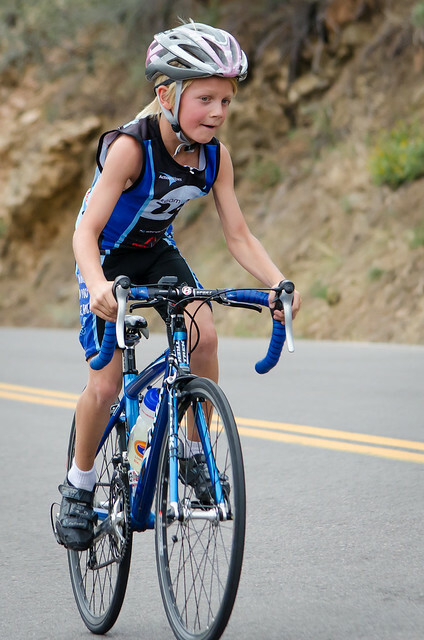 Speaking of kids, I couldn’t believe how young some of the racers were! This girl had great form and was moving up the mountain really well. By far my favorite composition of the night. Caught my friend just right. Love how the trees frame the road, and how the road twists in the background. Tim moving well as usual. 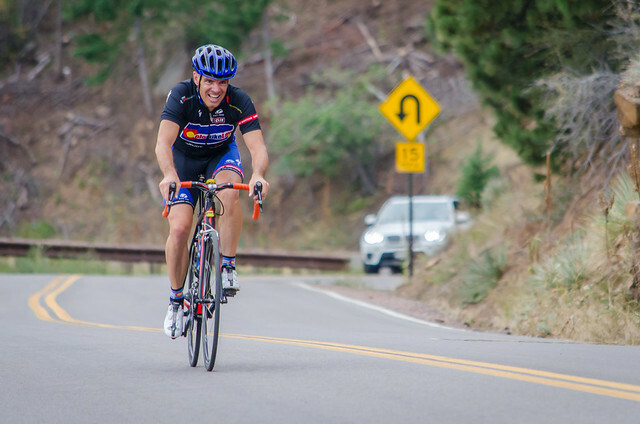 He favors a very efficient seated style with a high cadence, so of course I shouted at him to stand up and pedal like a man. Or something like that. 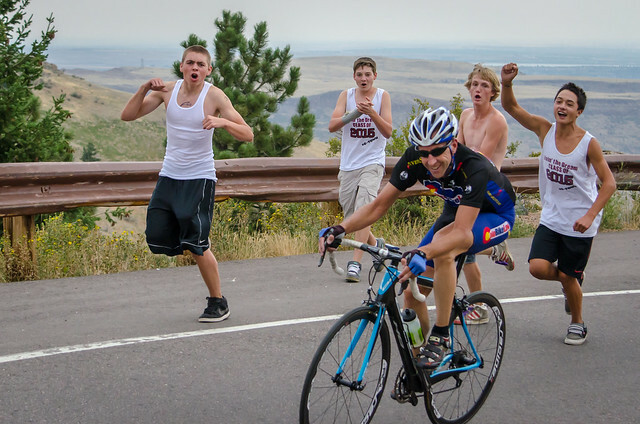 I had all of my new friends primed and ready to scream his name and generally go crazy as he rode by. 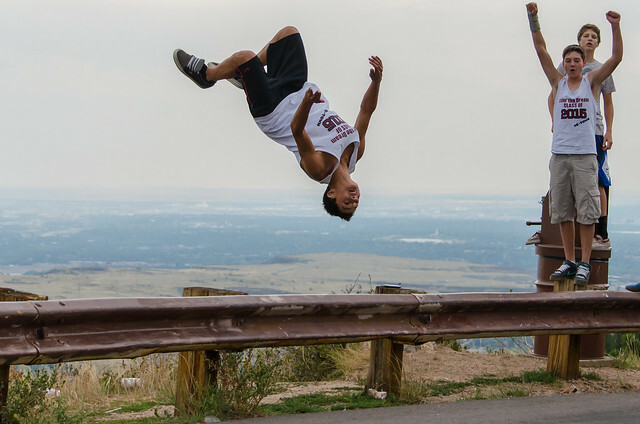 One was even into doing backflips off the guardrail! It’s hard to outrun a pack of crazy teenagers when you have already been climbing a mountain for 4 miles. You just have to grin and bear it! I had a fantastic time at the race! The location and vibe could not have been any better, and I’m really pleased with the photos I was able to get. See the entire set here. After a year and a half of including a ‘pic of the week’ at the end of my weekly training summary, I’ve decided to let it stand as a post of its own. I’m also implementing a rule that the Friday Foto needs to have been taken sometime in the last week. No recycling. I am doing this to keep me engaged in building my photography skills, and to make me work harder to get fresh shots. Click hereto see my previous Friday Foto posts. 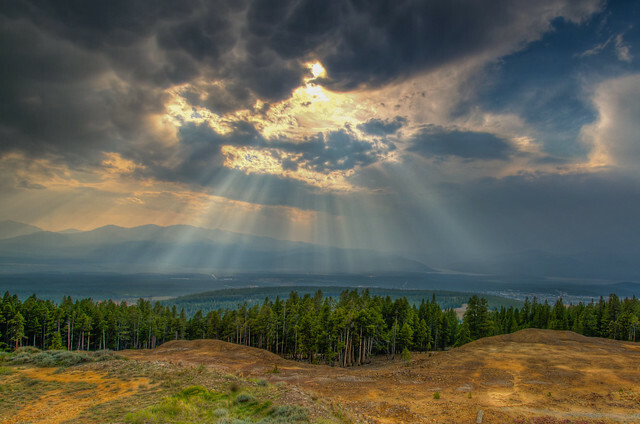 This is a shot of some crepuscular rays created by a departing storm last Friday afternoon high above Leadville, CO. While the rays are real, the angle of their appearance is an illusion created by linear perspective. The rays are actually parallel. They appear to converge at a point in the clouds just like railroad tracks come together when you look along their length. The rays go by many names. One that I found interesting was the Ropes of Maui, from the Maori legend that describes Maui Potiki restraining the sun to make the days longer because they were too short for everyone to get their work done. There is also speculation that the appearance of rays like these may have influenced the ancient Egyptians to build the pyramids. Looking at this picture, you can certainly see the possible connection. It looks a lot like the Eye of Providence (or all-seeing eye) on the back of a dollar bill. Either that, or a giant bar-code scanner.